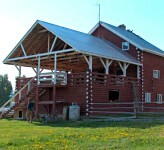 and it's a real working cattle ranch with a lot of nature and history at its doorstep. and some of the finest scenery in BC awaits you. Ever thought of going on a real cattle drive? 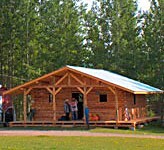 The Blackwater-Spruce Guest Ranch has prime BC Interior cattle that need to be moved out to open range. 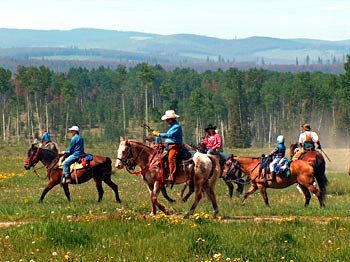 This is a chance to enjoy real western vacations. 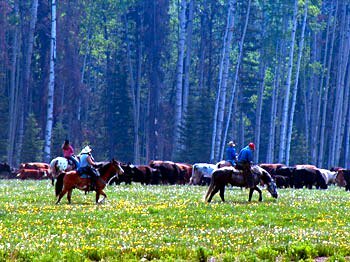 Twice a year there are cattle drives where there's lot's of adventure for you. This is true excitement as you re-live the activities of Pan Philips, one of the earliest cattlemen of the region! 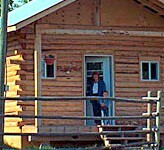 Take an adventure trip with Blackwater-Spruce Guest Ranch and observe the ancient trail markings as you go through forests, over hills, through streams and rivers along the prehistoric route known by the name of Carrier Trade Route, now part of the Heritage trail. 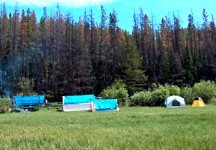 At the end of the day you'll camp early and enjoy the dazzling beauty of stars in the night sky. Every where you turn, along the way in the beautiful Blackwater region of BC's Cariboo Chilcotin, another beautiful creature flies by or skips across the water. Here, eagles fly high and co-exist with the peregrines, ospreys, bears, beavers, deer, coyote, ducks of all kinds. Pelicans fly so close to the water they glide by using the river as their highway as they make their way to the feeding grounds. Loons on the local lakes and streams cry out for all to hear as you walk through their meadows and brooks. and a large play area for the kids. the wagon is hooked up and ready go. 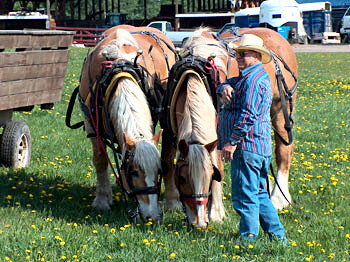 Authentic Guest Ranch & Western Vacations in BC's Cariboo Chilcotin.